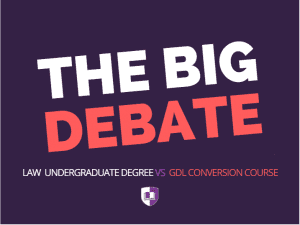 The Big Debate: Law Degree or Conversion Course? One of the most prominent questions when discussing routes into law, the LLB vs GDL argument instils indecision in all students at one point or other. To save you the hassle of hours of research, we brought together two contributors to write their own personal thoughts on the law degree or conversion course problem. Who do you think won? It’s your final year before university. Like most people, you don’t know what you want to study. You think you might want to be a lawyer – eventually, but you’re not sure. Why not study something you enjoy and worry about law later? This way, you’ll have a degree, and in time you can consider a conversion course, if that’s still what you want. You’re me, several years ago. Now, with the benefit of hindsight and experience, I’m here to tell you why you’re wrong. I thought studying a non-law subject was the right choice because it gave me more flexibility, when in fact the opposite is true. Studying an LLB gives you options. Do you want to practice law? Go into further study, potentially becoming an academic? Practice abroad? Drop everything and become a writer? Choose the LLB and each one of these remains open to you. The GDL is a fantastic way to condense essential knowledge into a year of studying. It’s a route towards becoming a solicitor or a barrister, but it doesn’t command much respect in any other field. An LLB will impress if you interview for jobs in politics, communications, media, where a GDL could look like little more than a curious mistake. There is a huge amount of respect afforded to those with a law degree. I attended dozens of interviews as a candidate with a philosophy degree, and dozens more after receiving my law degree, and there was a chasm between these experiences, and the results. Rightly or wrongly, it is much easier to get an interview, and a job, if you have a law degree. Maybe you want to be a lawyer, maybe you don’t. Embrace the uncertainty – take the LLB, keep your options open, and discover something fascinating in the meantime. The real beauty of the conversion course route into law is that you are given the space to pursue an undergraduate degree which is free from the particulars of your future career. I am an English graduate and so spent three years pondering the realms of Shakespeare, Gothic and the carnivalesque. Law was always in the back of my mind, but I knew that I wanted to study something purely academic – something theoretical and vibrant – after school. Whilst it probably wasn’t a very principled decision at the time, with hindsight I can say that it was in fact a tactical jackpot. Where my law graduate contemporaries brought a deep and exacting insight into the law, I brought a way with words and an appetite for narrative analysis. I am training to become a family law practitioner, and I found that my English degree informed my approach to case analysis. The precise, scientific style of a traditional legal mind is coupled with a more intuitive and inductive methodology. So too has my written advocacy benefited by the breadth of my academics. For example, I won an award for Opinion Writing on the BPTC which in my view is wholly attributable to the skills I learn as an undergraduate. I would also add that, throughout the pupillage application process, the fact that I had chosen to study the GDL was never held against me and questions were adjusted with non-LLB candidates in mind. Rather, interviewers were interested in authors I specialised in and I was told that my linguistic style impressed. At the end of the day, a good lawyer is about analysing and solving human problems: language and literature is largely the same. I would concede that, although the GDL tries hard (particularly at places like City University), it does not offer the same academic rigour of a law degree. GDL students have only one year, which in practice boils down to about eight months of teaching, to get you up-to-scratch on the fundamentals of the seven core legal areas. Obviously, therefore, there isn’t time to dwell on the subtleties hiding in the small corners of British jurisprudence. There also isn’t any flexibility or elasticity in the course to pursue the academic topics which interest you, save for perhaps your research elective. I would also admit that the whole year felt something of a rush, particularly once extra-curricular and pro bono commitments are thrown into the mix. I imagine a law degree would be at once more academically intensive and yet less intense overall. However, despite this, I would not say that I feel I am at any disadvantage in terms of my general grasp of legal thinking. About halfway through the GDL, everything somehow clicked together and I found I could start ‘thinking like a lawyer’. After that breakthrough, my confidence has only grown and I am now at home tackling big, unwieldy legal problems. Whilst I probably know less law than my law graduate contemporaries, I would argue that my capacity to understand law is largely equal. Indeed, a lawyer’s toolkit is comprised of far more than the sum of his legal teaching: innate skill and personal sensibilities occupy an equally important space. By way of example, the four students coming top overall on my BPTC were all City University GDL students. In fact, several law graduates said to me during the course that they were jealous that I had studied basic tort and contract as recently as last year, whereas they hadn’t visited Donoghue v Stevenson since Freshers. It is my opinion that the GDL offers a unique and clever route into legal practice: I feel fortified by the breadth of my academic training and the skills that I gained during my English degree have all been transferable to my career in one way or another. Whilst I accept that the GDL is a stressful burden to place on yourself, and I admit that I sometimes wish I had studied a proper family law course before commencing pupillage, I wouldn’t change the way I’ve done things. My English degree informs the way I think, write and express myself, and I hope that it will ultimately make me a better barrister. For that reason I would whole-heartedly recommend it to prospective lawyers. How does the GDL work? Find out here! How about studying law at university? The information is all here.